Change is something that scares the crap out of a lot of people. 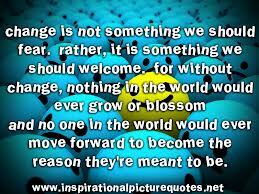 Change can mean going into the unknown and doing something out of the ordinary. I am currently going though a few changes in my life. I am in the process of changing degrees. I am currently doing social work however I am not finding it satisfying. I love some of the things we are learning about but others I find I am struggling with. When I first started uni I wanted to study HR. I missed out by a point. So I went on to study social work. It is an eye opener. I have also made heaps of new friends that I might not have made if it wasn’t for this course and some of them I class as close friends who I can tell anything to. This year however I have made the decision to change direction and go for my dream of completing a HR degree. Business is something that interest me and I will enjoy this course more. Another change that is happening is I am moving house. While this isn’t a big change I have been in my current place for over 3 years and I had hoped to be in here a while longer however about 3 moths ago when I resigned my lease it was only done for 6 months so I knew that this was coming. Thankfully I have 3 months to find a place and I am in fact looking at a place today which if I get I will be moved in by next weekend so things will get a little hectic here and I might not be posting much for those few weeks! I do like change though. Change is something different and new and while it can be scary and freak me out it’s a good feeling when you do something out of your comfort zone and succeed! Do you like change or do you resist it? What is the biggest change you have made of late? I like change most of the times. Depends on what the change is, if it created it or someone else. I do enjoy moving though. Gives me chance to clean out my stuff and get rid of things I haven’t used since I moved in. Enjoy the move and good luck! My biggest change…I’m going through it right now and just started so it’s too early to tell.